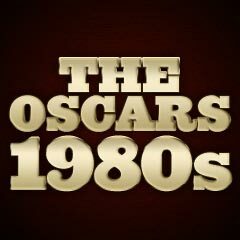 Beginning this year, the trademark phrase: "and the winner is..." was substituted with "and the Oscar goes to..."
Director Barry Levinson's critically and financially-successful Rain Man was the major Oscar winner in 1988. It was the buddy-road saga of the human relationship that gradually develops between two sibling brothers: the elder one a TV-obsessed, institutionalized adult autistic (Hoffman), the other an ambitious, hotshot money-maker/car salesman and hustler (Cruise). The autistic savant's kidnapping from an asylum by his fast-talking brother is with the intent to swindle him of his inheritance, but during a cross-country road trip, a loving relationship develops between the brothers with strong blood ties. 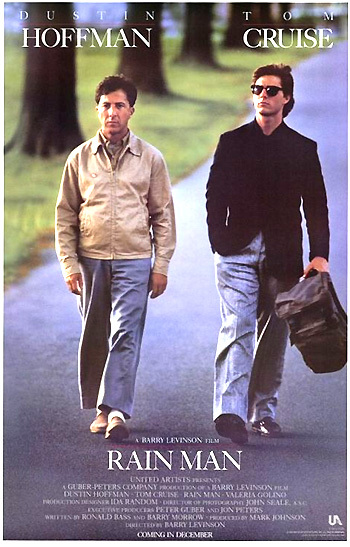 Rain Man had a total of eight nominations and four wins - for Best Picture, Best Actor, Best Director, and Best Original Screenplay (by Ronald Bass and Barry Morrow). It was the year's highest-grossing picture as well, taking in $173 million (domestic). Dustin Hoffman (with his sixth nomination) won his second Oscar for his role as the institutionalized, ultimately loveable, autistic idiot savant Raymond ('Ray(n)' 'Man(d)') Babbitt who is kidnapped by his ambitious brother Charlie Babbitt (Tom Cruise) and taken on a cross-country trip in Rain Man. In one memorable scene, Raymond nervously told his brother that he might miss his favorite TV program (The People's Court): "Uh, oh, 12 minutes to Wapner." Kevin Kline (with his first nomination), in the first surprise upset in the supporting categories, won the Best Supporting Actor Oscar for his performance as ex-CIA assassin and ne'er-do-well jewel thief Otto, the crazy boyfriend of seductress thief Wanda (Jamie Lee Curtis) who wants a repressed English lawyer (John Cleese) to offer bail to a fellow jewel thief in the unlikely comedy A Fish Called Wanda. Alec Guinness (with his fourth and last career nomination for acting) for his role as William Dorritt in director/screenwriter Christine Edzard's screen adaptation of Charles Dickens' little-read novel Little Dorritt - Guinness was a veteran Dickens actor who had performed in Great Expectations (1946), played the role of Fagin in David Lean's Oliver Twist (1948), and also acted in Scrooge (1970). Guinness had four acting nominations in his entire career: in 1952 (Best Actor for The Lavender Hill Mob (1952)), 1957 (Best Actor for The Bridge on the River Kwai (1957) - his only win), 1977 (Best Supporting Actor for Star Wars (1977)), and in this year. He was also nominated, his fifth, for Best Adapted Screenplay for The Horse's Mouth (1958). Geena Davis (with her first nomination), in a surprise upset, won the Best Supporting Actress award for her (lead!) role as eccentric and wacky divorcee (and Corgi dog-trainer) Muriel Pritchett who is interested in a married travel guide writer (William Hurt) with an estranged wife (Kathleen Turner) in The Accidental Tourist. The remaining nominees were Frances McDormand (with her first nomination) as conflicted Ku Klux Klan member's wife Mrs. Pell, one of the townsfolk in Mississippi Burning, and Michelle Pfeiffer (with her first nomination) as the reserved, convent-bred Madame de Tourvel in Dangerous Liaisons. This year had one of the most potent Best Foreign Language Film competitions in recent years. Bille August's Swedish film Pelle the Conqueror, starring Best Actor-nominated Sydow, defeated two other strong candidates among the field of four: Pedro Almodóvar's popular Women on the Verge of a Nervous Breakdown (its sole nomination) and Mira Nair's Indian expose Salaam Bombay! (its sole nomination). Although the technically-outstanding Who Framed Roger Rabbit (with six nominations) was missing from the Best Picture nominees, it tied Best Picture-winning Rain Man, if one counts a Special Achievement Award, with four Oscar wins: Best Film Editing, Best Sound Effects Editing, Best Visual Effects, and a special recognition for animator Richard Williams. Writer/director Hayao Miyazaki's acclaimed anime My Neighbor Totoro was conspicuously not nominated for anything. Two directors who should have been nominated, but weren't, were Penny Marshall for Big, and Jonathan Demme for Married to the Mob. A World Apart, Chris Menges' feature film directorial debut about apartheid set in early 1960s South Africa (with Barbara Hershey as journalist Diana Roth) wasn't even nominated in 1988. Neither was Michael Apted nominated as Best Director for Gorillas in the Mist.